SEOUL/BEIJING, Nov. 28 (Yonhap) – South Korea is considering expanding its own air defense zone further south to possibly include a reef that falls in China’s newly declared control area over the East China Sea, Seoul officials said Thursday. Seoul’s move came hours after China said it monitored a defiant flight by South Korea’s military through the Chinese Air Defense Identification Zone (ADIZ) that was announced by Beijing last Saturday. South Korea’s military conducted a surveillance flight through China’s new air control zone on Wednesday without informing the Chinese authorities, in a clear sign of defiance that Seoul will not recognize the new airspace claim that partly overlaps South Korea’s own zone and the South Korean-controlled submerged rock of Ieodo. The reaction by China’s foreign ministry to South Korea’s flight was similar with its response on Wednesday to flights by two U.S. B-52 bombers through the Chinese air zone in that it appeared to be modest while being assertive. Saturday’s declaration of the Chinese air zone requires all aircraft entering the zone to inform China of their flights and follow China’s instructions or face “defensive emergency measures” by the Chinese military. Earlier on Thursday, South Korea demanded China redraw its air zone during its annual defense talks with China. But the demand was met with almost immediate rejection. China’s actions are viewed as an attempt to bolster its claims to a group of islets in the East China Sea at the center of a bitter territorial dispute with Japan, which are known as Diaoyu in China and Senkaku in Japan. Tokyo has angrily protested China’s move, and the U.S. has sided with Japan by flying the B-52 bombers through the zone. In Seoul, South Korea’s presidential and other government officials and the ruling party lawmakers held a meeting on Thursday and reached consensus on expanding its own air defense zone further south that would likely include Ieodo, according to the officials. In 2003, South Korea built an unmanned maritime research station on Ieodo to monitor weather conditions and survey maritime features in the area as part of its efforts to reinforce jurisdiction over the submerged rock. 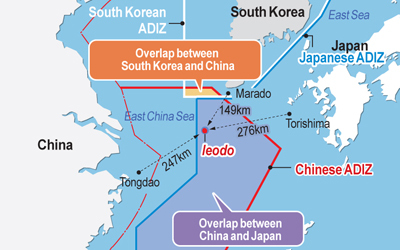 Ieodo, which lies closer to South Korea than any other country, is located 149 kilometers southwest of the country’s southernmost island of Marado and 247 km northeast of the nearest Chinese island Tongdao. Meanwhile, U.S. Vice President Joe Biden is set to visit South Korea, China and Japan next week, and the issue of China’s new air zone is expected to be at the top of the agenda during his week-long trip. While China’s official reactions to defiant flights by the U.S. and South Korea through its new air zone were modest, a state media outlet on Thursday warned of a potential “collision course” between Washington and Beijing as the U.S. apparently took sides with Japan over the long-simmering island dispute. 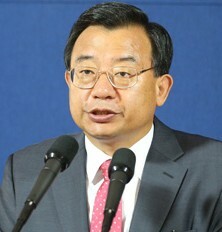 “Washington has been claiming that it does not take sides in disputes over China’s Diaoyu Islands. But the overflight of B-52s belies the truth of this,” the official China Daily said in an editorial.